It's too early for any sort of study of the "me too" movement or the full impact of the sexual inquiistion of 2017. There won't be any sort of "backing' other than opinion for some time. IOP.. the metoo is a joke that should been put out of its misery.. I be sure to wait 10 years down the road to complain about my boss touching me the wrong way.. but first i got to make sure they area famous enough to get PAID..
As far as investing goes it was actually pretty good. My dad invested in 2nd mortgages. He was getting 15-20% interest on it. I am concerned that the low interest rates dissuade people from saving their money and instead are too heavily reliant on the stock market. The personal savings rate was about 12% then now its less than 3%. I believe that makes us much more vulnerable to an economic downturn and having to rely on the government to survive. I too am concerned about the attenuated savings-rate, but I'd not blame it on low interest rates. The real change is cultural, rather than economic. The 1970s were a horrendous time for investment in conventional assets (stocks and bonds). Unconventional assets may have sporadically done well. I'm sure that that era had its analog to Bitcoin or whatever else is currently capturing the public's fascination. But the point is that buy-and-hold approach to paper-assets was a hapless and unsuccessful in 1966-1982, as it was during the Great Depression (if adjusted for inflation). ...You know as usual I believe all these complaints about who is at fault for why the country isn't as prosperous as it once was makes me wonder that it may really be no one's fault. It may just be the inevitability of change that happens to economies, societies and life itself. Indeed. And it's also likely the case, that we were NEVER as prosperous as we think that we were. It's a confabulation - not an actual memory. 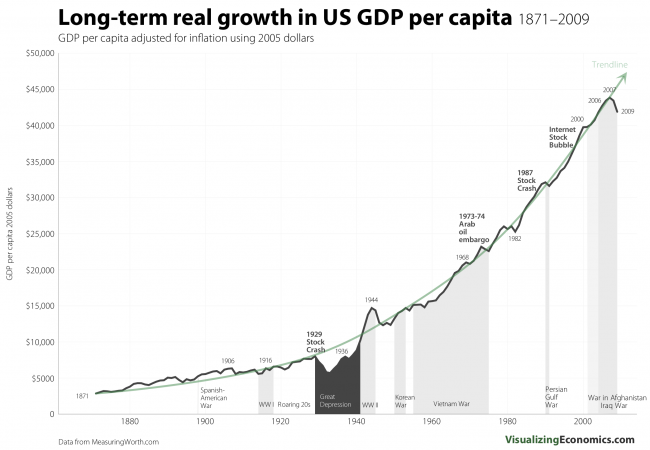 But another way to view that chart, is to notice that the past 40 years of "stagnation" are merely returning is to the trend-line of 1860-1930. That is, the hump from 1930 through 1970 was anomalous and unsustainable. No. The trend"line" is exponential. $18k in 1930 (vs $12.5k actual). Wage growth over 66 years is 70% of economic growth. $43k in 1975 (vs $37k actual). Wage growth over 115 years is 86% of economic growth. $96k in 2010 (vs $37k actual). Wage growth over 150 years is 39% of economic growth. The period since 1975 is the anomaly. Obviously it is inflation corrected. I got my first job in 1967. I was a nurse's aide in a convent nursing home in Massachusetts for the princely sum of $1.65 per hour. Part time, I was a kid in school. I think I told them I was a bit older than I actually was to get the job. Here's what I remember about the economics of those times. My dad worked and easily supported the 4 of us. We had a normal middle class life. We had a home, car, and went on vacation every year plus usually a trip to visit the grandparents in another state. We had pretty much everything we needed and most of what we wanted. Dad usually went on several hunting trips every year with his buddies as well. We all went to the dentist and the doctor at least twice a year. We weren't rich by any means but dad's job paid enough to take care of us quite well. To the best of my knowledge, my parents didn't fight about money and we had no problems paying the bills. My father was not a college graduate. He was able to use the GI Bill for training in accounting after WWII and Korea. Working people then were much more secure than they are today. You could pretty much assume that as long as you worked hard, you could retire from your job. You were not constantly afraid of losing your job. And most likely your job had healthcare and a pension included. Things sure did change and not for the better. I had a hair dryer in the 60’s. But straigtened my hair with a real iron on the ironing board. But, economically, I was a college freshman in ‘67 and had part time jobs — which were plentiful — at minimum wage. Minimum wage was just for students back then, and after a short time a nickel raise was an expectation and given. By the time I achieved my degree in ‘71, the economy was more challenging from a job hunting perspective. OK, let's use those numbers. Let's plug in $5000 in 1860, and $12,500 in 1930. For that to work, the annual growth rate would have to be 1.32%. That's it... just 1.32%. Let's check our work: 5000 * (1 + 1.32/100)^70 =~ 12500. Now let's take (1 + 1.32/100)^150, to get to 2010. The result? $37,700. What does this mean? It means that the bulge in workers' wages from 1930 through 1975, pretty much cancels the stagnation since 1975... and we're right back on to the trend-line from 1860 to 1930.